This shouldn’t surprise regular readers. You see, I’ve been warning about Tesla’s problems for months. In October, I told you how the electric car maker was having major problems with its production line. I also explained why its share price could soon fall off a cliff. If you didn’t take my advice, I urge you to read this essay closely. It’s surged more than 800% since 2013. After a run like that, most investors would take some chips off the table. But many of Tesla’s shareholders haven’t. That’s because they’re a different breed. They don’t care that the company’s bleeding cash. They don’t care that it’s drowning in debt. They don’t even mind that its stock is trading at a sky-high premium. Do You Think We’re Nuts? We’d like to pass along a very special invitation only for Casey subscribers. In fact, what we’re about to share may seem a little nuts… but it could mean a lot of extra money in your pocket. Warning: you only have until midnight, January 28th to get the details on this opportunity. Click here to learn more. They live in a world of pure imagination. They think nothing can go wrong just because Tesla’s a pioneer in the electric vehicle (EV) industry…and Elon Musk is a genius. Now, these things might be true. But you cannot ignore major problems just because of a company’s grand ambitions. Yet, that’s what many Tesla shareholders are doing. But they won’t get away with this for much longer. Even Tesla employees can’t stay quiet about them. CNBC published a story yesterday that outlines major problems at Tesla’s Gigafactory. This is where Tesla produces batteries for its vehicles. Current and former employees are saying Tesla’s production is far worse than reported. Apparently, the company’s building some batteries “by hand.” There are also reports of Tesla borrowing employees from one of its partners to help out with production. Worst of all, some employees now believe batteries are leaving the factory with “potentially serious” defects. That’s because Tesla has a history of overpromising and underdelivering. For instance, Musk said in August that the company would produce 1,500 Model 3s for the third quarter. But as I showed you in this Dispatch, it only delivered 260 vehicles. That’s an 83% shortfall. Then in November, he scrapped the company’s longtime goal of eventually producing 10,000 Model 3s per week. In 1 day, this gentleman almost lost his entire $1,000,000 life savings. But by using his "secret key" technique… he saved all his money… generated a fortune… and got to retire at 42, with more security than he’d ever imagined. The most surprising part? His "secret key" wasn’t a one-time tactic. It’s been responsible for 389 winners and counting… and he’s been quietly using it for the past 26 years to make millions. Click here and see his "secret key" in action. This tells me Tesla is desperately trying to buy itself time. But the market seems to be losing patience with the carmaker. Just look at this chart. 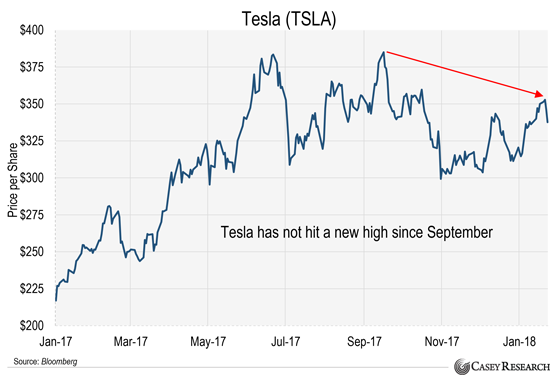 You can see that Tesla hasn’t set a new high since September. It’s treading water. At this point, it’s likely one production whiff away from tanking. I’m not the only investor who thinks this, either. “Tesla will face several milestones in 2018 relative to the ramping of production of the Model 3, which we believe will be difficult for the company to meet, particularly if its substantial miss to volume targets in 2017 are to be any guide,” wrote [JPMorgan analyst Ryan] Brinkman. But JPMorgan didn’t just issue this warning. It encouraged its clients to short (bet against) the high-flying stock. That’s because it thinks Tesla’s stock could plunge 40% over the next 12 months. That would be a brutal sell-off. But Jim Chanos is even more bearish. That’s right. Chanos thinks Tesla’s stock will hit zero. These are not people you want to bet against. So, I’ll repeat what I’ve been saying since August: Avoid Tesla at all costs. You can demonize or belittle Jeff Sessions all you want. He's just doing his job, which is to uphold existing laws. We've had too many years of those in power selectively enforcing the law, and evidently you are OK with that when it suits your purposes. I'm not big fan of Jeff, but he's not the problem nor the solution in this particular issue. On the subject of crypto (I'll not call it currency, because it's not) it's obvious that they can and have been manipulated, stolen, hacked, created out of thin air, etc. So why should I trust them as an alternative to the existing government-controlled system? Now is the best time to join Casey Platinum, our elite membership where you can get everything we publish at Casey Research for pennies on the dollar compared to what others pay. Over the years, our recommendations could have turned $10,000 into $68,000… $84,900… even an extraordinary $126,000. And now, we’re slashing the price of this membership—which includes EVERYTHING we publish—by up to 95%. Click here to learn more. But hurry. You must act by midnight this Sunday, January 28th to be grandfathered in before the price hike.